Yesterday, the housemates were pair were reshuffled, and the game saw Tobi get paired with BamBam, and Cee-C to Lolu. 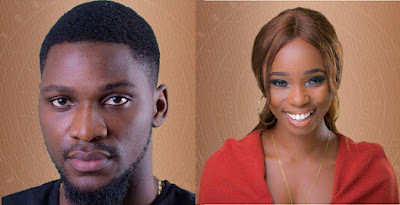 Tobi was paired with BamBam, and he was a totally different person. Yesterday, he opened up to BamBam, and he was so comfortable with her, that he shocked viewers by smoking.. Though, he tried to rush the cigarette, and BamBam asked why.. Tobi said, “There is a part about me I don’t like people seeing”, thus insinuating that he didn’t want Cee-C to know he smokes. While in bed, when Bam Bam called him a player, he smiled, telling her he is a retired Yoruba demon. He also said he was the Secretary of the Yoruba demons association from the age of 12. However, he revealed he is now retired and is not in the house to be strategic but is also letting his emotions show. Meanwhile, a jealous Cee was glaring at him having a nice time with Bam Bam.